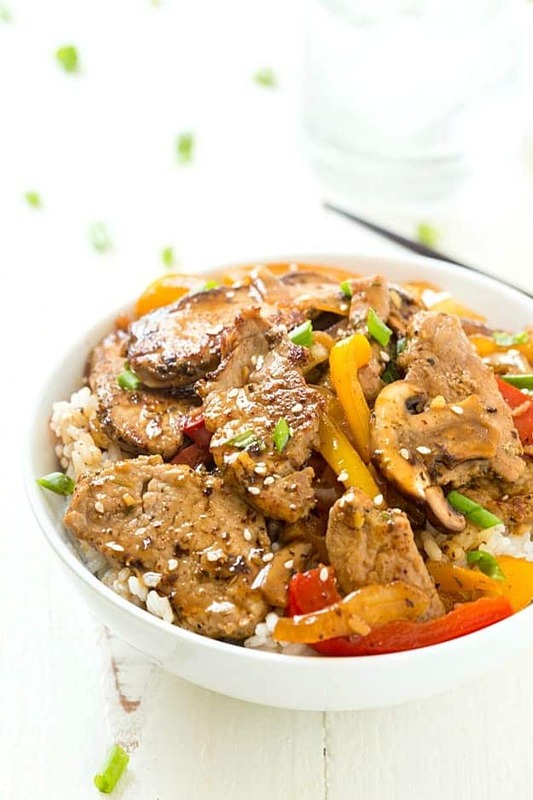 Quick and Easy Pork Stir Fry – Tender slices of marinated pork sautéed with colorful bell peppers, mushrooms, and onions, then coated in a quick and easy homemade sauce! Ready and on the table in under 30 minutes! Back-to-school time is a hard time for all families with hectic schedules, and the last thing you need to worry about is what’s for dinner. Our family loves stir-fries, but we seldom make them because I tend to overlook them. Every time I make a stir fry, I have it in my mind that I always need to marinate the meat beforehand for optimal flavor. Now time doesn’t always allow that to happen, so today I am going to share a little secret with you. You are going to love it! This quick and easy pork stir-fry is perfect for those hectic nights when you need to get dinner on the table in under 30 minutes. Stir-fries are popular for a reason – they are so quick, and it’s a great way to use any vegetables you need to use up. 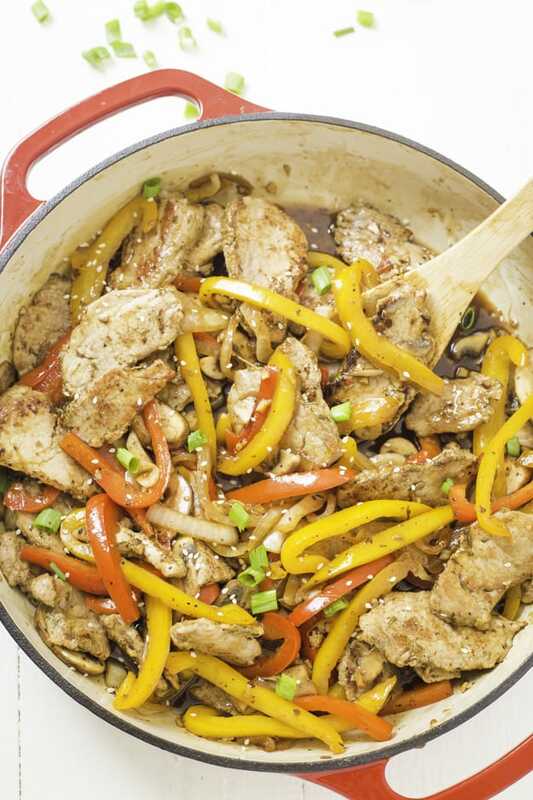 This pork stir-fry is loaded with delicious ingredients like marinated pork, bell peppers, onions, and mushrooms. For this recipe, you will need thin slices of pork. A little trick to easily slicing thin strips is to place your pork tenderloin in the freezer for 10 minutes. It’s the perfect time to prep and slice your vegetables! There are two ways to make this pork stir-fry. I like to cook my thinly sliced pork in batches because it adds a little color to the meat and it doesn’t water down the sauce. If you are in a hurry, you can fry the meat and vegetables in the skillet or wok at the same time. Just remember to drain any liquid from the skillet or wok before adding the sauce. 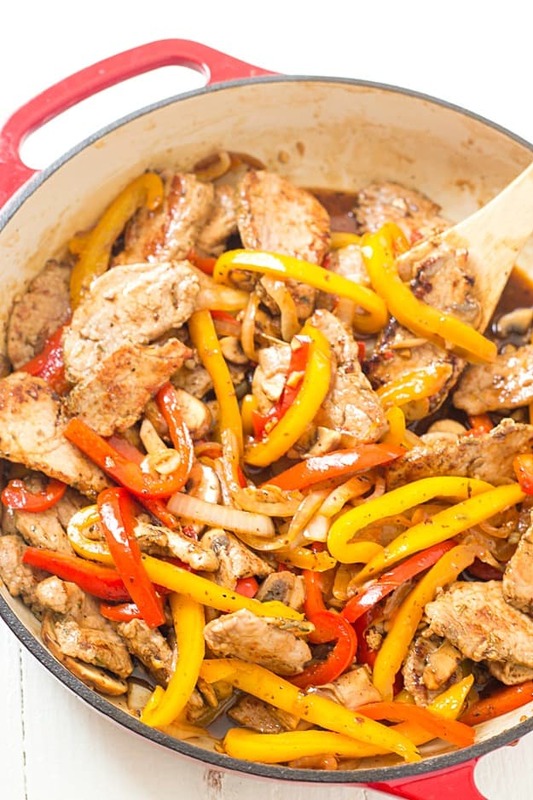 Quick and Easy Pork Stir Fry - Tender slices of marinated pork sautéed with colorful bell peppers, mushrooms, and onions, then coated in a quick and easy homemade sauce! Ready and on the table in under 30 minutes! Preheat your wok or skillet and place 1 tablespoon of oil into the pan. Place half of the thinly sliced pork strips into the wok or skillet and cook on medium heat for 1-2 minutes per side or until the pork is cooked through. Remove the cooked pork from the wok or skillet and repeat with the rest of the pork. Set aside. Whisk together the soy sauce, ¼ cup water, brown sugar, honey, garlic, pepper, and cornstarch. Place the sauce into the same pan and simmer over medium heat until the sauce comes to a simmer. Whisk together ¼ cup water and cornstarch together and whisk into the sauce. Cook for 5 minutes or until sauce has thickened. Remove from wok or skillet and set aside. Place the oil, red bell pepper, yellow bell pepper, and onion to the wok or skillet and sauté until the vegetables are tender. Place the mushrooms into the wok or skillet and sauté for 2 minutes. Place the cooked pork and sauce back into the wok or skillet and mix until combined. Serve on top of rice with green onions and sesame seeds. *Place the pork tenderloin in the freezer for 10 minutes to easily slice into thin strips. 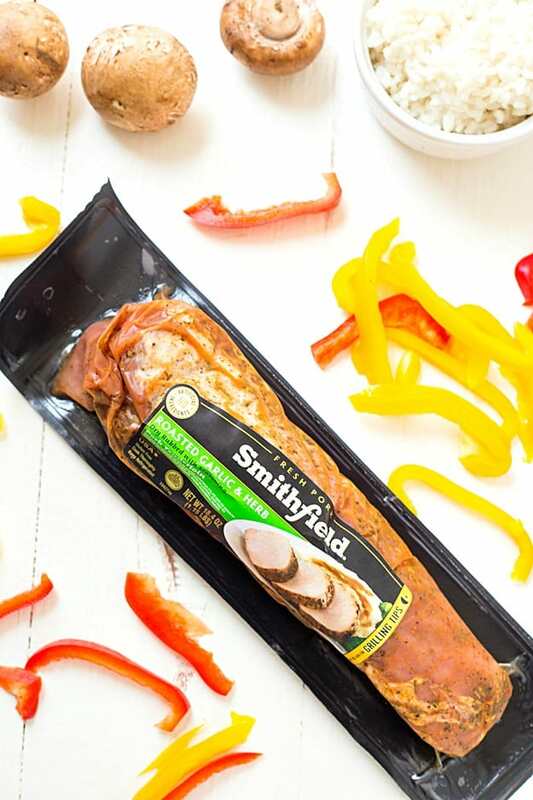 Visit Smithfield Marinated Fresh Pork for more ideas on recipes and look for Smithfield Marinated Pork at your local Food Lion! The stir fry sauce ingredients call for 1/4 cup of water, separated; yet the instructions appear to require 1/2 cup. Also, I could not find in the ingredients list the amount of cornstarch needed to thicken the sauce. Forgive me; I am a novice at this and need as much direction as I’m able to find. Thank you for pointing this out, Steve! The ingredients and directions have been fixed. Enjoy!